A small news story, but one I'm glad to see. 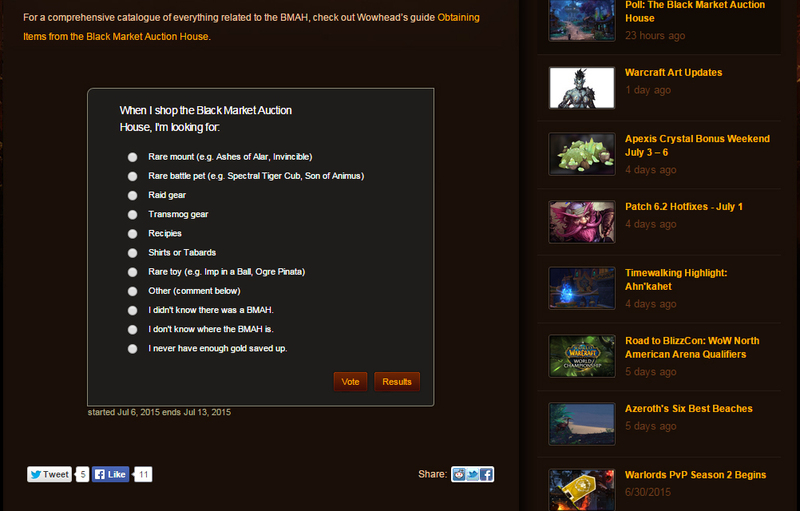 Blizzard have taken to their official forums to seek feedback on player use of the Black Market Auction House. There's a fair few options in the poll and the community feedback has already flooded in. As to why they're asking for feedback, I'm really not sure. I suspect part of the reason is many players don't realise the Black Market Auction House is there to be used while the other is that many might also not realise it can be brought into your Garrison. Maybe Blizzard have alternative reasons for the polling but more than anything, it's great to see the company engaging with their community in this way. I wish I could say the same for others. As for poll results, unsurprisingly the two most common answers are a lack of gold and using the Black Market Auction House for a rare mount.